American disco band formed in 1976 by guitarist and producer Nile Rodgers and late bassist Bernard Edwards. Their most familiar disco-classics include the much-sampled 'Good Times', 'Dance, Dance, Dance', 'Everybody Dance', 'Le Freak', 'I Want Your Love' and 'My Forbidden Lover'. 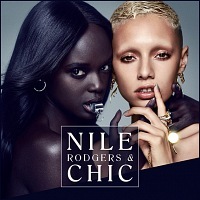 Chic released their first album in almost two decades in 2018, "It's About Time" featuring the singles: "I'll be There" and "Till The World Falls".